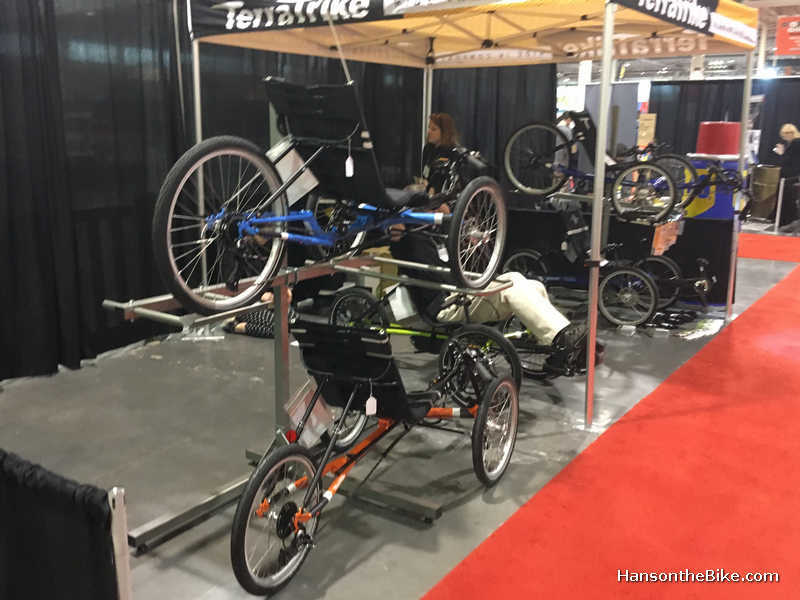 A few weeks ago in Toronto I helped out OK Cycle Tours from Ottawa at the booth at Toronto’s bicycle show. 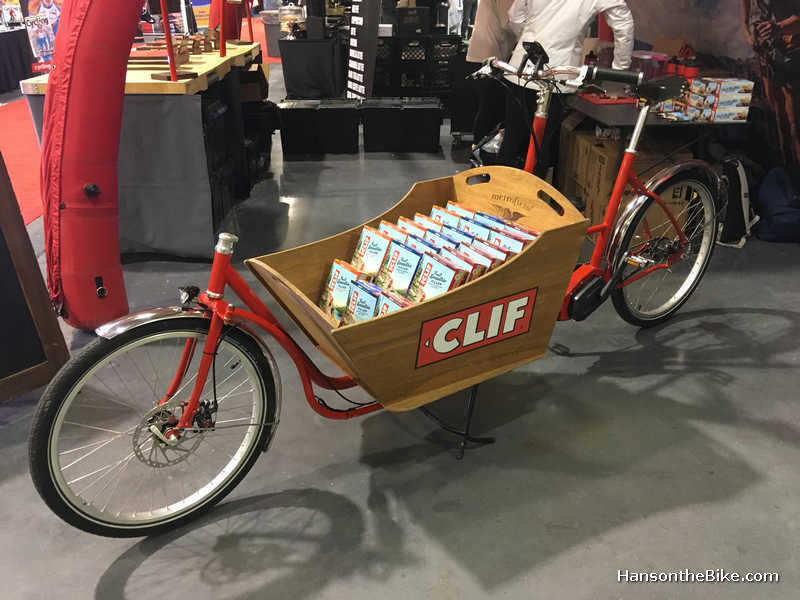 Billed as the “World’s Largest Consumer Bicycle Show” I had some expectation that was not really matching the reality I learned. I was smaller than I expected, mostly local and not overly busy at times. There were times that the isles felt empty. I asked for visitor numbers, but didn’t got a reply (yet). I am estimating there were perhaps about 20,000 based on what I saw in Montreal the week before? 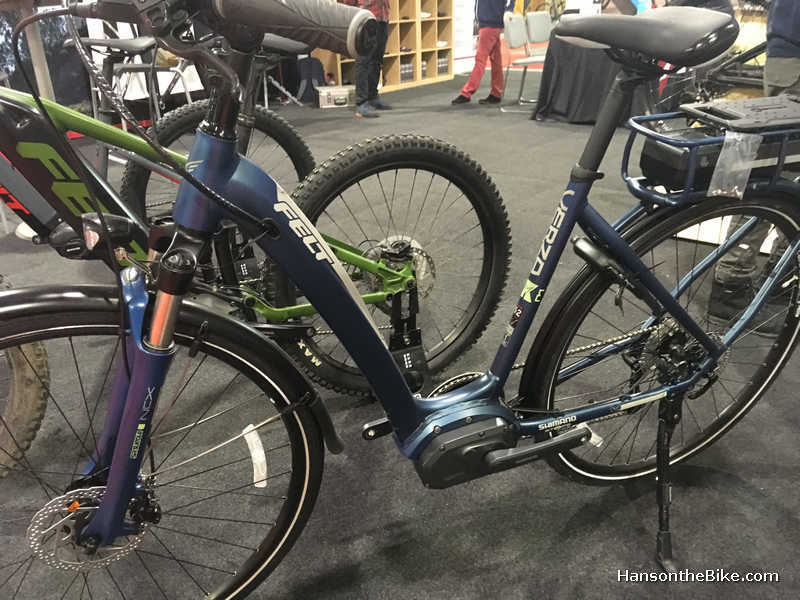 For comparison sake, I did a quick check on line and the Fahrrad-Essen has over 80,000 visitors, the Fiets- en Wandelbeurs in Utrecht over 40,000, the Cycle Mode show in Japan over 30,000 and the For Bikes Show in the Czech Republic over 30,000 visitors to name just a few that I could find. So it might be the biggest, but it certainly didn’t feel like it. 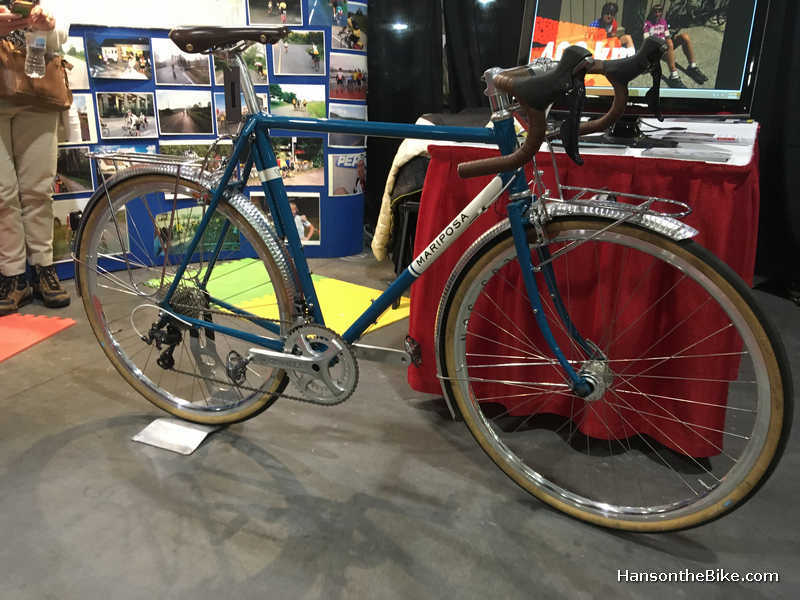 Yet, it is always interesting to visit bicycle shows at the end of the winter, if only to see all those shiny bikes when your own bike is covered with salt and mud from winter cycling. 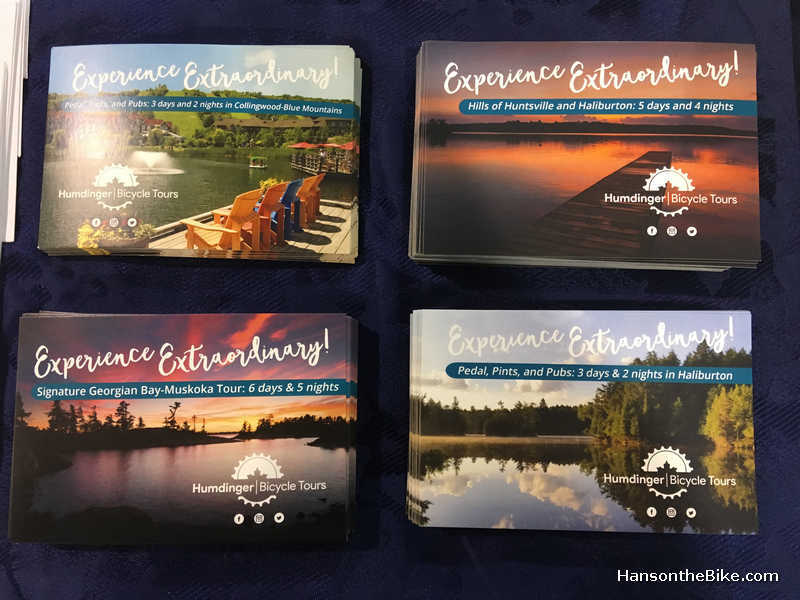 Dropping by at the booths of the several tour companies and regions offering bike routes and socialise with providers is another activity that gets you in the mood of spring cycling. I kind of liked the Italian Basso Palta. Taxes included, you are looking at around 5000 dollars and up here. Outfitted for ‘bike packing’ here I learned. 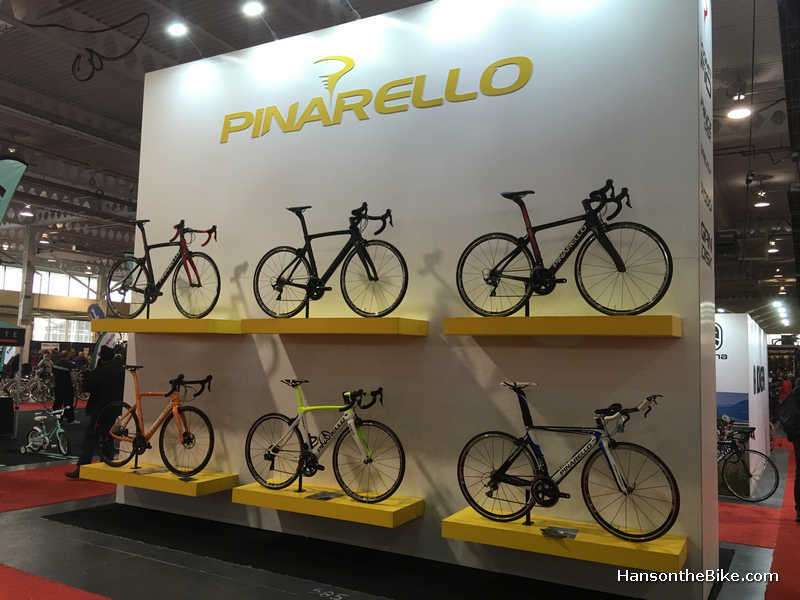 There is definitely a lot to see, but I would see it feels more like a last year’s models sales show than a place where you get to see all the latest and the greatest developments in cycling. I am not talking about a new frame that is slightly stiffer than others, but about all the developments that are happening in the world of cycling. I guess I am just more wearing an urban-city-cycling-livable-city-bike-as-transportation hat than a road or gravel bike hat. It was very much the same as the Montreal show a week before, but with larger amounts of bicycles available. Some retailers go all out, even running their own temporary network of cash registers connected to a central server to ring up all those sales. I think Gears had about 20 people at the 45 ft x 100 ft booth. There was lots of marked down clothing and temporary tent like changing rooms to try that new flashy jersey. 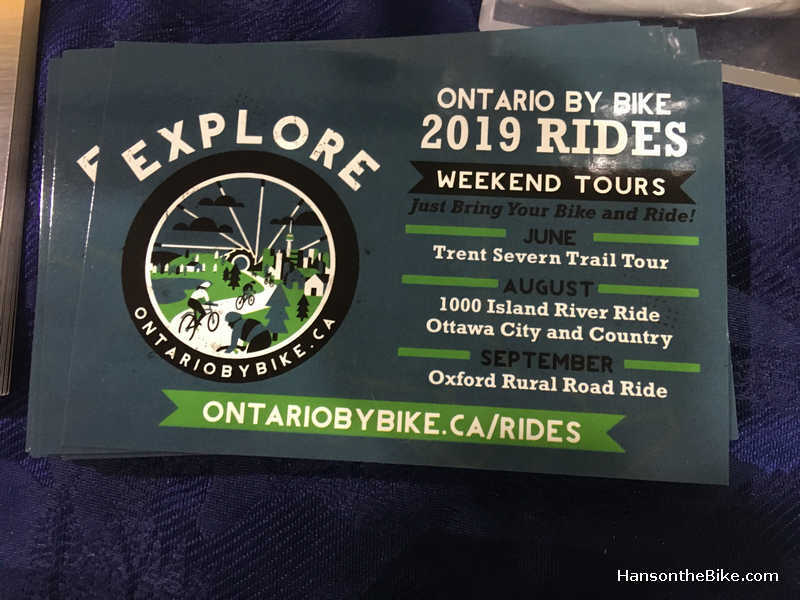 A number of Ontario and Quebec regions were promoting their regional cycling routes. This is encouraging as I didn’t have all the options on my radar screen. The show is nice to get a quick overview of what the state of affairs is in bike route promotion in Ontario. I would have loved to see Ottawa here with a booth to show our bike options: I think it would be a big hit. Ottawa as a cycling tourist destination is still too much unknown and there is pioneerwork to be done. The people I talked to who had been to Ottawa were definitely super pumped about the Ottawa region’s cycling options. 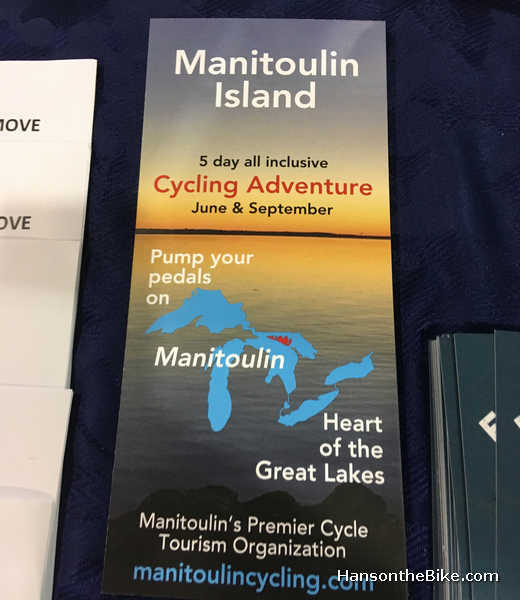 Manitoulin Island touring is apparently becoming super popular, from I was told at their booth. We must have been there 15 years ago and really liked the quiet country roads. I did see a few gems too such as the recumbents, the bullet shaped bike, some interesting e-bikes, the former (?) 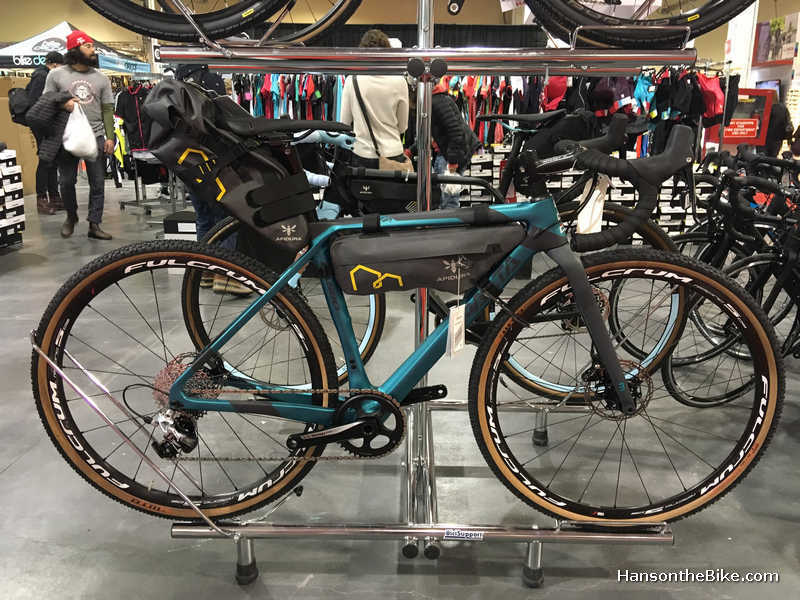 bike of the president of Randonneurs Ontario and a Metrofiets cargobike from Portland, Oregon, which closed in spring 2018 after 11 years in business. A nice low step through from Felt, ideal for Anouk Hoedeman of bird rescue Safe Wings Ottawa. What a great birthday gift this could be while supporting a good cause. And here I thought “MetroFiets” was a Dutch company, but no, they operated from Portland, Oregon. Wike from the Wike Bicycle Company in Guelph. 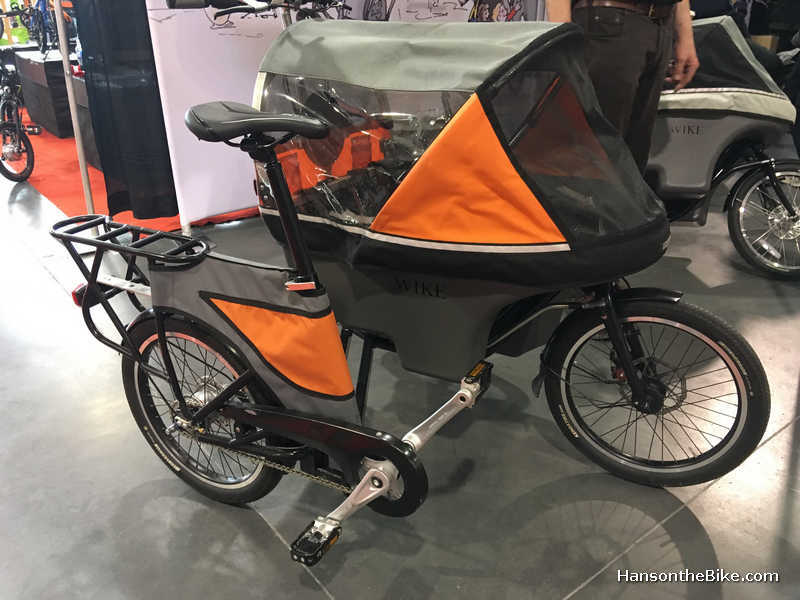 This looks odd, but it is actually a cargo bike with a hinge, allowing you to fold the back part next to the cargo part, turning it into a stroller. Very nifty. 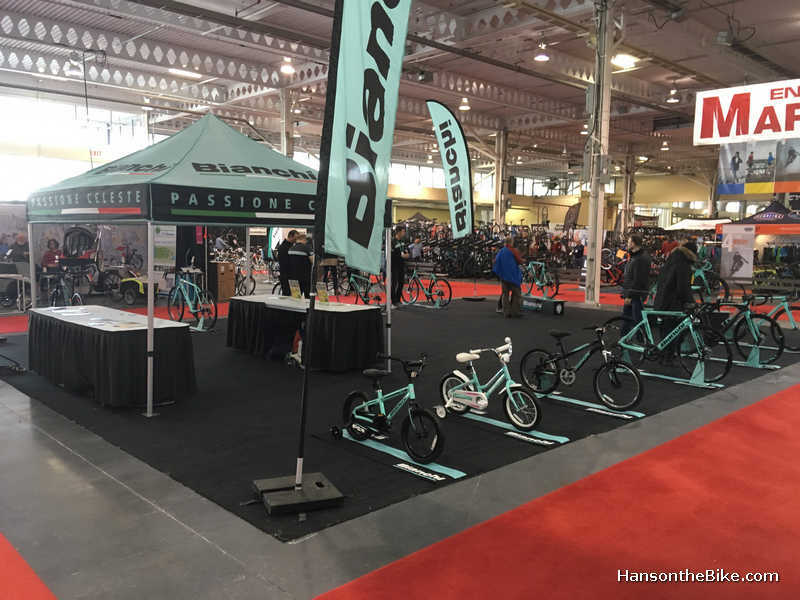 An oversized disappointing Bianchi booth. Dov’è la passione, porca miseria? 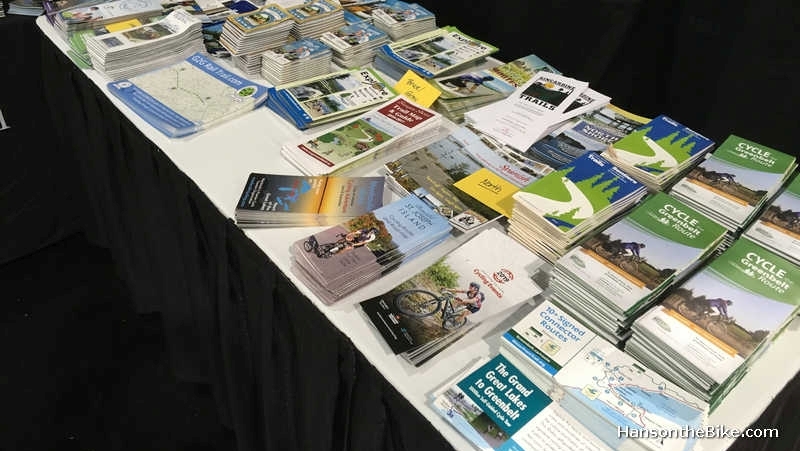 If you want to get more info on cycling routes in Ottawa, a good place to start is Go Biking.ca ; it has a number of choices covering different distances in Ottawa. Another place to find routes is the City of Ottawa website, but many routes are shared with car traffic in the rural areas, just so that you know. For the casual visiting tourists, you can also find routes at the rental page of Escape Bicycle Tours & Rentals. Starting downtown, the routes take you to a number of interesting sights and destinations. 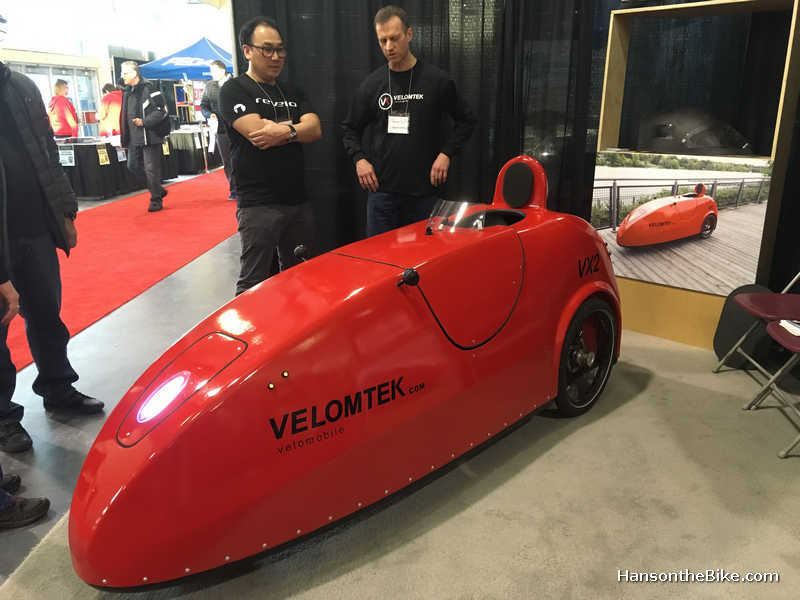 I think I actually liked the Montreal bike show a bit more. While smaller, I found it a bit more complete. See a blog and a clip here.